Providing a practical guide to the training and assessment of non-technical skills within high-risk industries, this book will be of direct interest to safety and training professionals working within aviation, healthcare, rail, maritime, and other high-risk industries. Currently, each of these industries are working to integrate non-technical skills into their training and certification processes, particularly in light of increasing international regulation in this area. However, there is no definitive guidance to assist practitioners within these areas with the design of effective non-technical skills training and assessment programs. This book sets out to fully meet this need. It has been designed as a practically focussed companion to the 2008 book Safety at the Sharp End by Flin, O'Connor and Crichton. While Safety at the Sharp End provides the definitive exploration of the need for non-technical skills training, and examines in detail the main components of non-technical skills as they relate to safe operations, the text does not focus on the "nuts and bolts" of designing training and assessment programs. 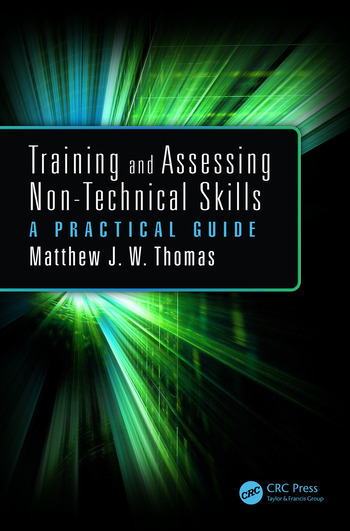 To this end, Training and Assessing Non-Technical Skills: A Practical Guide provides an extension of this work and a fitting companion text. Matthew Thomas is the Deputy Director of the Appleton Institute at CQUniversity, and Director of Westwood-Thomas Associates. He works on providing scientifically defensible solutions to enhancing human performance and managing safety in high-risk industries. His research expertise lies with human error, non-technical skills, incident investigation and data utilisation within safety management systems. He completed his PhD in virtual learning environments in the year 2000, and since then has explored innovative solutions to a wide range of Human Factors issues in high-risk industries. He has provided solutions to enhance the non-technical skills of professionals working in a cross section of high-risk industries including commercial aviation, rail, maritime, healthcare, defence, mining, utilities, and beyond. He contributes to a group of not-for-profit organisations worldwide, and currently is the Chair of the Council of the Australian Patient Safety Foundation, Immediate Past President of the Australian Aviation Psychology Association, and a member of the Australian Advisory Board of the Flight Safety Foundation. "Thomas’s book points out that in recent decades, though, that perception began to shift. And as that shift occurred, developing and assessing the art of doing something has become nearly as exact as measuring the science of doing it. In three sections, Training and Assessing Non-Technical Skills explores this evolution, and shows how readers can take advantage of it on a day-to-day basis. Altogether, this combination of broad information and practical strategies makes Training and Assessing Non-Technical Skills a valuable read, especially for those in high-risk industries that rely heavily on simulation-based training. Whether you’re new to designing these types of learning programs or a seasoned veteran, it should be useful for improving your practice."